Legislative representation in Ghana dates back to 1950, when the country was a British colony known as Gold Coast. The body, called the Legislative Council, was purely advisory as the Governor exercised all legislative and executive powers. Reforms were introduced in 1916 and 1925, although the governor's power remained extensive. In 1946, a new constitution was introduced that allowed for an unofficial member of the Legislative Council to become its president while the governor ceased to be the ex officio president of the body. This system continued until 1951 when the Legislature elected its first Speaker - Sir Emmanuel Charles Quist. 1951 was also the first year that elections based on universal suffrage were held. The Convention People's Party (CPP), which was formed in 1949 and led by Kwame Nkrumah, won the election. Another party, the United Gold Coast Convention (UGCC) led by J.B. Danquah, fared poorly, and was disbanded soon after. Nkrumah, who had been jailed in early 1950 for subversion, was released and appointed Leader of Government Business, becoming the country's first Prime Minister the following year. Legislative Assembly elections held in 1954 resulted in another CPP victory, with the party winning 71 out of a total of 104 seats. It also won 71 out of 104 seats in the 1956 Legislative Assembly election. The Gold Coast was renamed Ghana and granted independence on 6 March 1957, while retaining the British monarch as head of state. The Legislative Assembly was renamed National Assembly. After the approval of a new Republican constitution, Ghana officially became a republic on 1 July 1960 with Kwame Nkrumah as its President. The plebiscite was taken as a fresh mandate from the people and the terms of National Assembly members were extended for another five years. A one-party state was introduced following a referendum in 1964. As a result, only CPP candidates stood in the National Assembly Election held in 1965. Nkrumah was overthrown in 1966 by the military, which banned political parties and dissolved the National Assembly. The country returned to civilian rule in 1969. Elections held on 29 August resulted in victory for the Progress Party (PP) of Kofi Abrefa Busia, which won 105 of the National Assembly's 140 seats. He took office as Prime Minister on 3 September 1969. His government was toppled in a 1972 military coup. During the Third Republic, which lasted from 1979 to 1981, the dominant party in the National Assembly was the People's National Party (PNP), which won 71 out of 104 seats in elections held on 18 June 1979. After the military intervened in 1981, all elected institutions were dissolved and political party activity was prohibited. After 11 years of military rule, a new constitution was approved in a 1992 referendum. Presidential elections were held in November and were won by Jerry Rawlings, leader of the 1981 coup and subsequent military ruler. The opposition contested the results and boycotted the December parliamentary elections. As a result, Rawlings' National Democratic Congress (NDC) won 189 out of 200 seats in Parliament. All parties participated in the 1996 parliamentary elections. The NDC won 133 out of a total of 200 seats, while the main opposition New Patriotic Party (NPP) won 60. Two small parties won the remaining seats. The 2000 elections were significant in that President Rawlings was constitutionally barred from seeking another term. In the presidential poll, John Kufuor of the NPP defeated the NDC candidate John Atta Mills in a run-off election. In the 200-seat Parliament, the NPP won 100, followed by the NDC's 92. Small political parties and independents won the remaining seats. Kufuor was re-elected in 2004 and the New Patriotic Party (NPP) won 128 out of 230 seats in the concurrent parliamentary election. The main opposition National Democratic Congress (NDC) won 94, while two other parties - The People's National Convention (PNC) and Convention People's Party (CPP) - won 4 and 3 seats, respectively. An Independent captured the remaining seat. The simple majority (or First Past the Post) voting system is used in Ghana's parliamentary elections. Since 2012, the country is divided into 275 single-member constituencies. Members serve four-year terms. Speaker - The Speaker presides over the Parliament and enforces observance of all rules that govern its conduct. After a general election the majority party in Parliament, in consultation with other parties, nominates a Speaker. The Speaker cannot be a Member of Parliament though he/she must possess the qualifications to stand for elections as a Member of Parliament, such person on appointment as Speaker must resign and declare the seat occupied in Parliament as vacant. The Speaker is assisted by two Deputy Speakers (First and Second Deputy Speakers), who are elected at the commencement of every Parliament. They must come from different political parties. The current Speaker is Prof. Aaron Mike Ocquaye former MP for Dome-Kwabenya constituency of Ghana. 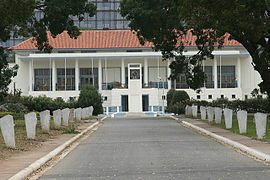 First Deputy Speaker - The First Deputy Speaker presides over the sittings of Parliament whenever the Speaker is absent. The current First Deputy Speaker is Joseph Osei Owusu of the New Patriotic Party (NPP). Second Deputy Speaker - The Second Deputy Speaker presides over the sittings of Parliament in the absence of the Speaker and the First Deputy Speaker. The current Second Deputy Speaker is Alban Bagbin of the National Democratic Congress (NDC). Majority Leader - The Majority Leader is elected from the party with a majority of parliamentary seats. A deputy majority leader and a majority chief whip assist him, constituting the majority leadership of Parliament. The current Majority Leader is Osei Kyei-Mensah Bonsu of the NPP. Minority Leader - The Minority leader is elected from the second largest party in Parliament. A deputy minority leader and a chief whip assist him, constituting the minority leadership of Parliament. The current Minority Leader is Haruna Iddrisu of the NDC. Map of Ghana's parliamentary constituencies as per MP's party affiliation as at 2008. NB: Where constituencies are too small to be shown (i.e. Accra and Tamale Metropolitan Areas) the majority party elected in the district is shown. For a list of current members, see MPs elected in the Ghanaian parliamentary election, 2012. The composition of the Parliament has changed over the years. There were 140 members in both the Second and the Third Republic parliaments. In the current Fourth Republic, the number of MPs have increased first to 200 and subsequently to 275. There have been 6 parliaments so far in the Fourth Republic. The list of its members are below. This page was last edited on 28 September 2018, at 15:12 (UTC).